I will be giving the following presentations at the Yachtsmen’s Luncheon at the Newport Harbor Yacht Club, located at 720 E. Bay, Balboa (in Newport Beach on the Peninsula).Â Each presentation starts at noon and concludes at about 1:20 pm.Â The cost is $13 and includes a buffet lunch. You do not need to be a member of the NHYC to attend and this is open to the public. Also, at the February 23 luncheon I will have “Traveler” dockside at the NHYC and available for inspection beginning at 11:30 am and after the luncheon. You may forward this email to a friend. The more the better, but please call to make a reservation atÂ 949-673-7730. I hope to see you there. The Voyage of Traveler came to a spectacular finish on July 3 when we completed a three-year circumnavigation by crossing our out-bound track and sailing into Newport Harbor. family and friends joining in a cheerful (and for me, a tearful) champagne toast. Please check out the Traveler website (voyageoftraveler.com) and click on the link, through Picasa, to the YouTube video of our Homecoming. I was so thankful to have Barbara back on board for the final leg, and really needed her for the rough ride up the coast, aptly called the Baja Bash. Barbara has been so much more than my girlfriend since we met on Transpac 2005–the best five years of my life! She was also my partner and co-captain on this voyage, and she was deeply missed when she had to go back to teaching–after sailing with me more than two-thirds of the way around the world. Thank you, Barbara, for everything. I had much to think about as Barbara, my son Brian and I made our final passage up Baja California. It was truly an emotional cocktail for me: a shot of accomplishment, to be sure, as we approached our home port and could “smell the barn,” plus a double shot of relief as the reality started to sink in that we made it. We sailed through harm’s way so many times, without serious problems. But that mixed drink of emotions also came with a dash of melancholy. It’s strange, but just as much as I wanted to finish the circumnavigation, I also did not want my life’s dream to come to end. brother Gary for logisitical support in his dinghy at the start of Transpac. I also want to thank Bis Houssels, Harry Wallace and Richard Higbie for all their help while I was gone; and special thanks to my Voyage Of Traveler webmaster and email postman, Jim Palmer. all the ups and downs, as we raced across the Pacific Ocean together for 2,250 nautical miles and smiles. And we trophied, placing second in class! I also want to thank all the other crew who joined us for a leg or two, making it a more fun and memorable voyage. In chronological order: Robbie Buck (Hawaiian Islands), Dan Bornholdt and Larry Sharpless (Hawaii to Tahiti and for Larry also across the Atlantic from Canary Islands to St.
to Tangier, Morocco), my sister Melissa (for her second leg on Martinique, Dominica and Guadelope, and her third leg with Charlie and Eliza from St. Thomas to Puerto Rico), my brother Drew (St. Lucia, Martinique and Dominica), Bill and Marsha Horsfall (Panama Canal), and my nephew Ryan (Puerta Vallarta to La Paz). Also, a very special thank you to my son Brian, who was a huge part of the voyage, with three long legs: from Waikiki, Oahu across the Pacific Ocean to Papeete, Tahiti; then from Singapore across the Indian Ocean to Aden, Yemen; and finally from Nice, France through the Med, across the Atlantic Ocean, all through the Caribbean and transiting the Panama Canal, and then up the Pacific Coast all the way back to Newport Beach. How many 21-year-olds can say they have sailed across three oceans and visited 40 countries? We have about 2,000 photos. I selected the Best 50 Photos for each of the three years, and posted them on the website. I hope you enjoy them. Well, after 31,145 nautical miles, as my final log entry I report to you, both sadly and joyously, that the Endless Summer of the Voyage of Traveler, as all good things, has come to a successful and glorious end. We did it. We lived the dream. P. S. What’s next? Hmmmm…. It is back to work. I need to replenish the cruising kitty. 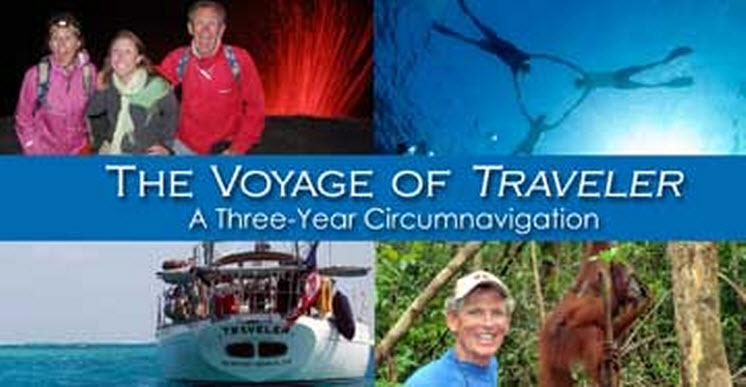 But Barbara and I are considering sailing to Hawaii on Transpac ‘11, which starts July 4, 2011. I’m working with a video producer to put together a mini-documentary about our voyage.